According to Adel Syed, the Government Relations officer at CAIR LA, b y about 3:00 p.m., there were already about 400 people gathered and growing. Looking at their picture below, with all the US flags on a sunny day, it sure looks like an event every American could be proud of. I had written about this practice Nazi rally back on March 6 and earlier. At the time, when I had roundly condemned it, some ultra-patriots called me on it and said I was (and CAIR was) lying, that the footage shown in the CAIR video was really two DIFFERENT event stitched into one…a manipulated video that made it look like the same groups was doing all the awful things when it was not true. This morning, I spoke with Adel Syed, the Government relations officer at CAIR LA and got the facts from him directly. Adel was there as of about 2:00 p.m. along with another CAIR person who was shooting the video from which CAIR drew clips for their YouTube video. CAIR’s YouTube video comprised of two parts, one which the staffer shot and the other, which was shot by Tea Party activist George Collins. Shortly after CAIR uploaded its video on YouTube with excerpts from Collins’ video, Collins filed a copyright claim and forced YouTube to take CAIR’s video down. However, CAIR informed YouTube of the fact that the Collins footage was being used properly by CAIR and under Fair Use rules CAIR can use it so, the video was put up again. Collins and the Tea Party and Republican Party supporters protested that CAIR had used Collins’ footage out of context and that if people wanted to actually see the full, raw footage, they could see it at the site where Collins had uploaded the entire 60-minute video. Shortly after it was uploaded, REAL Americans decided that the full footage was even worse than the excerpts that CAIR had used so they told Collins who promptly removed his “raw video”. ACT for America, an organization fronted by Brigette Gabriel, that is so protective of Israel that they believe every Muslim ought to be kicked out of this country or destroyed; obviously they forgot that Jews in Europe suffered from similar attitudes. Chabad House, led by Rabbi David Eliezrei who was one of the featured speakers at this hate-fest and who has apparently, also decided to forget the events that led to the Shoah…or, perhaps he believes that another Shoah should be coming along, as long as it happens to “Muzlems“. Tea Party, a growing political movement comprised of many sincere people, but has been taken down the path of ultra-patriotism expressed as anti-Muslim speech and actions; the theory being that they are protecting the US from imposition of Shariah code, a preposterous fantasy, believed only by the naïve or the manipulative. The Republican Party, in this case, largely by the fact that they remained silent while their party political leaders fuelled the flames of fear and hate against Islam and Muslims. At other times, the Republican party has actively promoted hate and fear against Islam and Muslims. Newt Gingrich, an aspiring Presidential 2012 candidate compared Muslims to Nazis. At other times, he has set up the fig-leaf concealing his bigotry and condemned “Radical “Islam which, to most Americans is like “patriotism”; they may not be able to describe it but they can feel it…as did Der Fuhrer and his supporters. As for those misguided or opportunistic Jews who are currently fighting Muslims and Islam, I suppose they are too embroiled in their passionate “defense” of Israel, to recognize that the so-called Christians who are supporting Israel and Jews today, will be looking at the Jews after the “Muzlem threat” has been destroyed…”then there was no one left to defend me“…again! The featured speaker of the ICNA fund raiser was Imam Siraj Wahaj, a prominent American Muslim who started his own Mosque, Masjid Al Taqwa in Brooklyn. He has the distinction of being the first Muslim to offer an invocation in the House of Representative in 1991. For his troubles, he has been labeled as a “terrorist” by the Ultra-patriotic Right Wing…and by the people who called a protest rally at Yorba Linda. The fundraiser was scheduled from 5:30 p.m. to 8:30 p.m., but the protestors called for people to gather against the fundraiser starting 2:00 p.m.; by about 3:00 p.m., there were about 400 people gathered and foaming against the fundraising event. The “stage” was on a trailer behind a truck and parked about 50-100 yards behind where the Muslim families were passing in order to enter the premises of the fundraiser…a point where the protester focused on as Muslims began to arrive. In the meantime, speaker after bigoted, opportunistic speaker clambered on the “stage” and spoke against Islam, Muslims, ICNA and Siraj Wahaj, as their way of defending America. 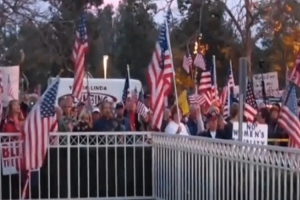 Among the speakers were Reps. Ed Royce and Gary Miller, who praised the “protest” and passed out American Flags as if to suggest the protesters were engaged in patriotic behavior. “Make no mistake my friends. Exactly what we are confronting here is evil and the weapons of evil, including lies and deception. You saw this flyer (holds up flyer for Muslim charity event), look at this flyer. They’re talking about, uhhhh, protecting disaster response and relief and women’s housing and hunger prevention and family counseling, medical aid and emergency financial support and funeral and burial assistance. Oh my goodness, aren’t they wonderful? Let me tell you, $25 a head for 300 people, that’s $7,500. Her supporters…and there are many…claim her words were “taken out of context”. Since for copyright reasons, CAIR is not allowed to show Pauly’s speech in the original video, they published a transcript of the entire Pauly speech; the statements above are copied by me, directly from there. Defenders from the right wing, claim that the stage setting and the harassment of the Muslims were two different events. It would challenge even the simplest of minds, to take such a stand. The people were the same people, the location was the same within yards and the speakers were condemning the same fundraising event and its speakers. How does that make it a different event? 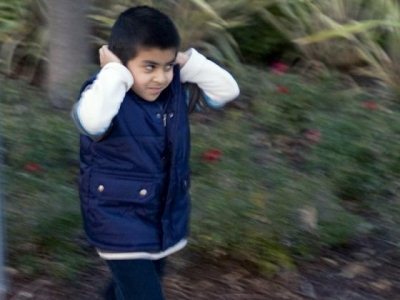 The members of the public who were screaming their insults and epithets against Islam and Muslims had been whipped up into a frenzy for over three hours before they were let loose on the Muslims and one can just see and hear the venom they spewed at the Muslim men and women, not even sparing the children. A news clip from ABC News shows the hostility of the crowds, how they were “defending” Israel ands turning this show of filth into a Judaism vs, Islam confrontation by blowing the Shofars; the clip also shows Rep. Miller, still at the event, speaking against the fundraiser, turning the “two events” position on its head. I have done my due diligence and made certain that my reportage was accurate and that indeed, the supposed “two events” were one and the same and the “protest” crowds were also the same…plus or minus a few Neanderthals. However, I doubt if the closed minds of the ultra-patriots are open to understanding this or, to condemning this most un-American and inhuman of actions. Now, people of good will have to step forward, quaking knees notwithstanding, they have to take a stand and take action now and in the next 2012 elections by voting the scoundrels out of office unless they too wish to be part of the growing evil that hides behind the flags of ultra-patriotism.